LOUISVILLE, Ky. (Sept. 17, 2017) — Helen “Penny” Chenery, owner of 1973 Triple Crown winner Secretariat, who became a well-loved figure in her own right as a champion of Thoroughbreds and women in business and sports, died on Saturday, Sept.16 in her Colorado home following complications from a stroke. She was 95. Penny’s children announced her death through Leonard Lusky, her longtime friend and business partner. Following Secretariat’s retirement from racing, Penny became an ambassador for Thoroughbred racing and remained so even after the champion’s death in 1989. She served as the first female president of the Thoroughbred Owners and Breeders Association (TOBA) and president of the Grayson-Jockey Club Research Foundation. 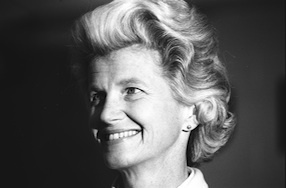 She became one of the first women admitted to The Jockey Club, helped found the Thoroughbred Retirement Foundation (TRF) and created the Secretariat Vox Populi Award annually honoring racing’s most popular horse, as well as the Secretariat Foundation, which assists and supports various charities within the racing community. Penny received the 2006 Eclipse Award of Merit for lifetime contributions to the Thoroughbred industry, and in recent years, she advocated for laminitis research and care advancement as well as efforts to ban the use of performance-enhancing drugs in racing. Penny is survived by four children: Sarah Manning, Chris Tweedy, Kate Tweedy and John Tweedy; and by six grandchildren: Elena McGrath, Alice McGrath, Chris Manning, Amanda Tweedy, Paige Tweedy, and Marcus Tweedy; and by one stepson Jon Ringquist.